Boarded the Otztaler shuttle service and I was the only guest travelling from Innsbruck in the morning since I had unknowingly booked a private shuttle. Little traffic on Christmas day made sure I was in the hotel in by 9:40am even when the driver was late by 45 minutes. It took about an hour and 10 minutes to reach Hochsölden from Innsbruck station. 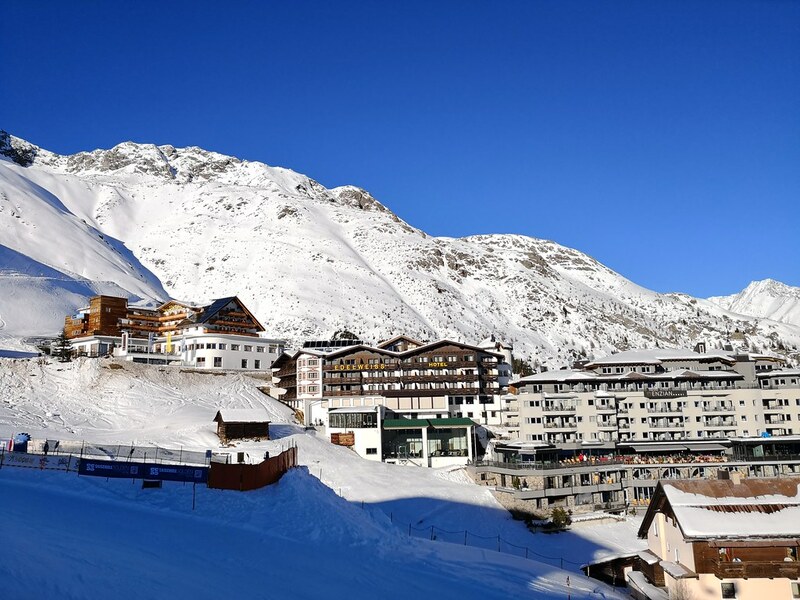 While I was skiing in Sölden, the Skihotel Edelweiss is located at the upper village which requires cars to drive up the mountain. 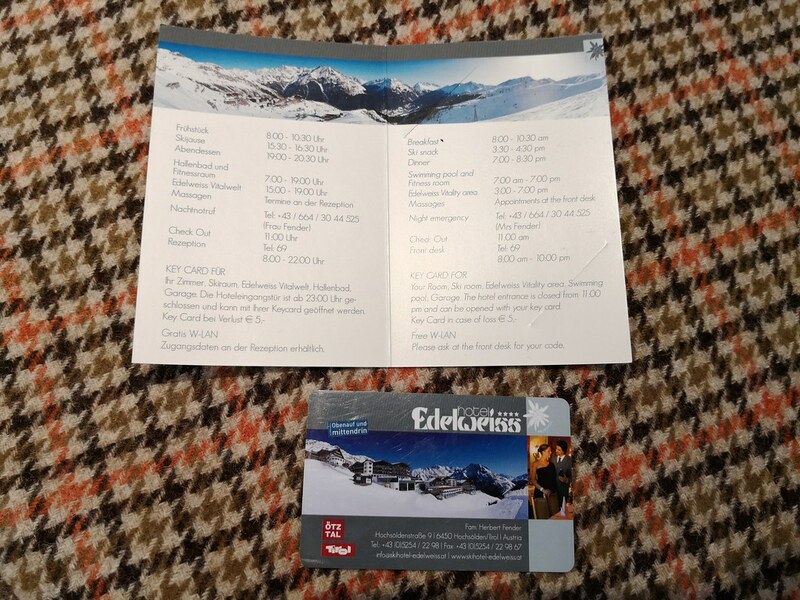 What it means is that the hotel is a true ski-in/ski-out hotel with skiers being able to ski out directly to the slopes and back to the hotel at the end of the day. Its location higher up also means skiers do not need to rush with the crowds on the last run down to the village. However the hotel’s driveway can be steep and narrow to navigate especially after a heavy snowfall so skiers driving here would probably consider staying down in the village rather than here. The hotel was empty of guests when I checked in and I was surprised to have the room ready. After going through some paperwork, the receptionist brought me around the premises to show me the facilities. I was also introduced to the owner manager and one of the servers, Daniel who worked for a period of time on cruise ships and can speak a bit of Bahasa Indonesia. 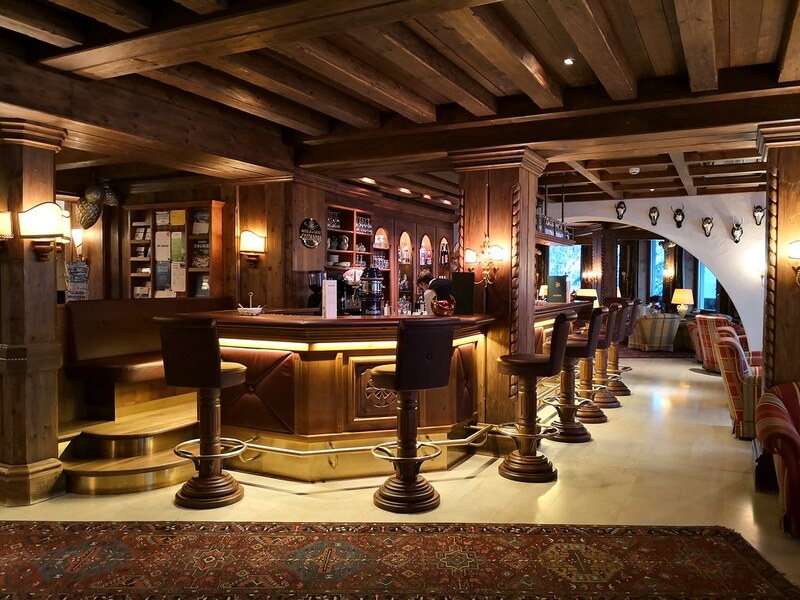 As a family-owned property, guests can certainly feel the warmth of the service here. 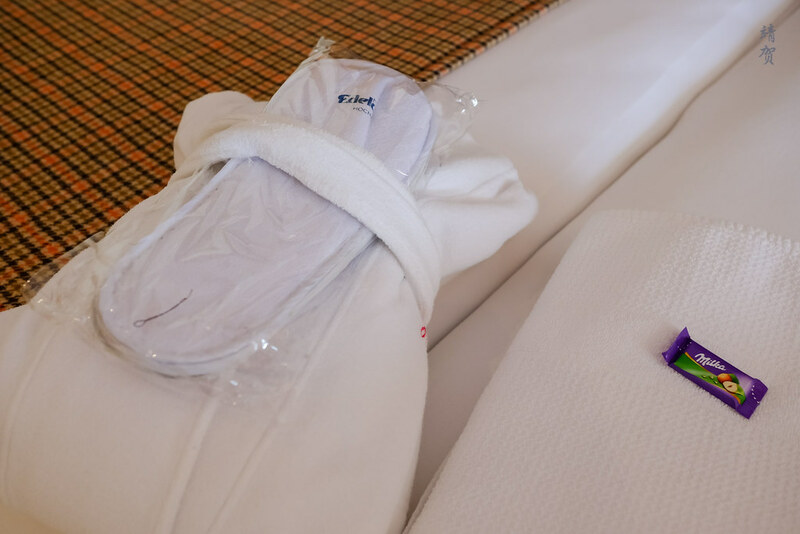 It was certainly a different level of personal service in the hotel compared to the service I get from chain hotels like Sheratons and Hiltons. The front desk agent also showed me the ski storage area one floor below the lobby and allowed me to deposit my skis there before bringing me to see my room. 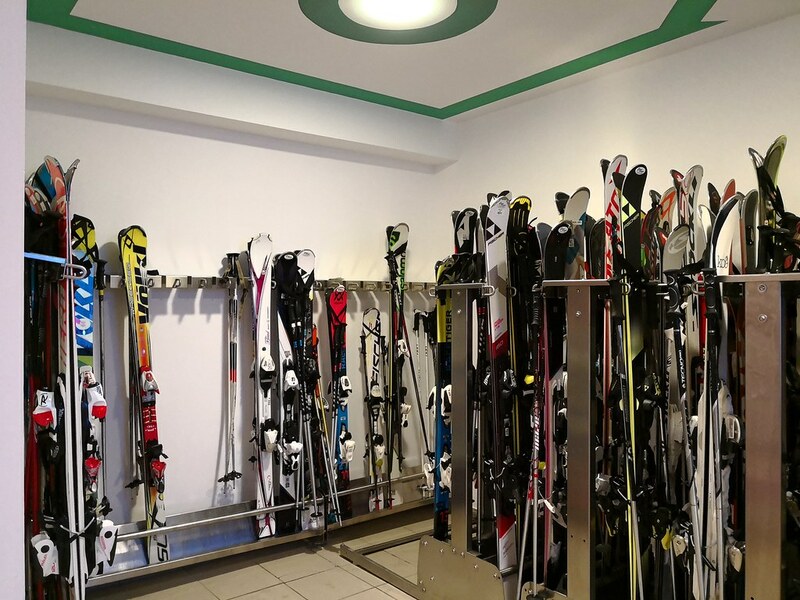 Unlike past ski hotels I have been to, this one has a communal rack for guests to store their skis, snowboard and boots. This meant the space was on a first come, first served basis with no lock to secure your expensive skis or boots. I do not believe theft is common here since only guests would store their skis here but the lack of a private storage locker would pose a bit of a problem as I was accused by another guest of taking her spot on the boot rack. A lack of video surveillance meant it was my word against hers, though it did provide me a lesson on the benefits of a dedicated ski locker. 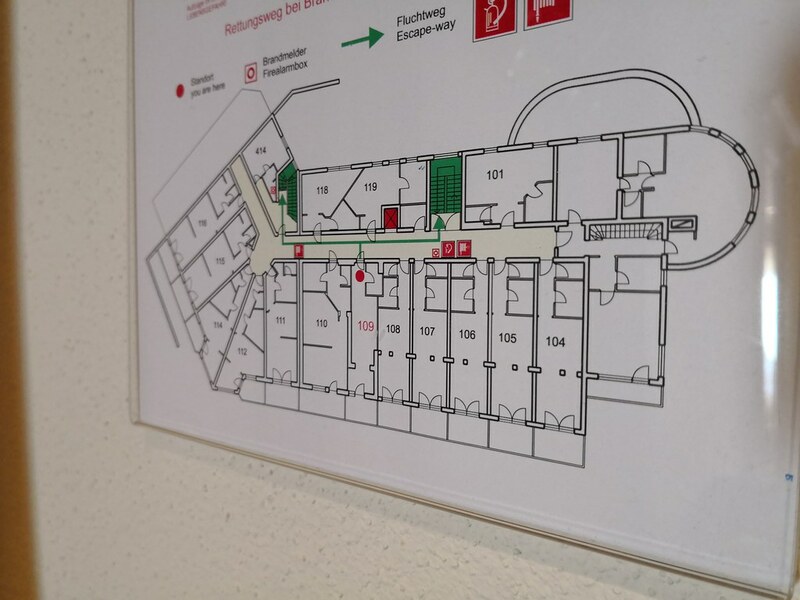 Upon reaching the room on the first floor, one level above the lobby, the staff handed me my room key which has a folder that provides the opening hours of the hotel’s facilities in German and English. The hotel has one slow elevator so I found it faster to get to the restaurants and lounges by the stairs. My assigned room was itself close by the elevators and from the hotel floor plan below it can be seen it is one of the smallest rooms but it did face the right direction towards the slopes. Like many older ski lodges, the rooms here seems to be unique due to the irregular floor plan and that would mean guests might not necessarily get a room in this layout. This was the room I reserved and seems to be a step up from the most basic room as it comes with a balcony with a better view. Inside the room, on the right was a straight corridor leading to the room with several coat hooks by the wall. 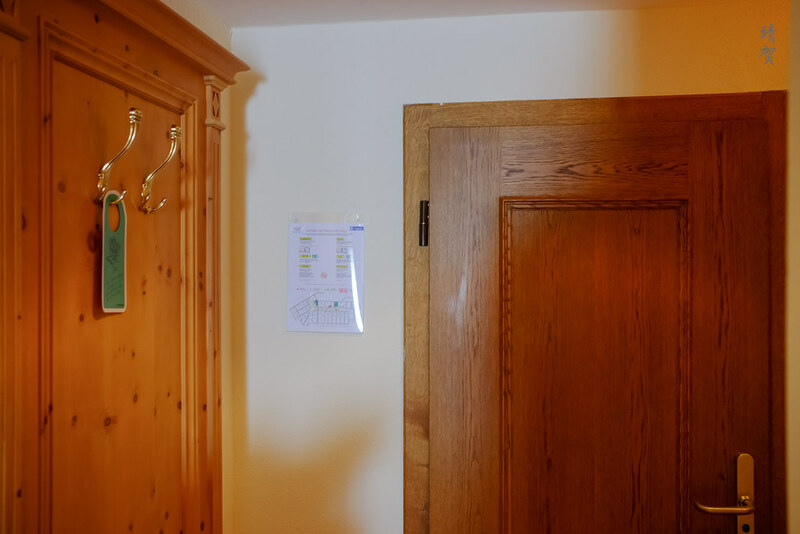 This is a useful feature to have in any ski hotel as these hooks are great to hang your ski jackets to let it dry. After all the first thing you want to do once inside is take off your ski jacket after skiing. 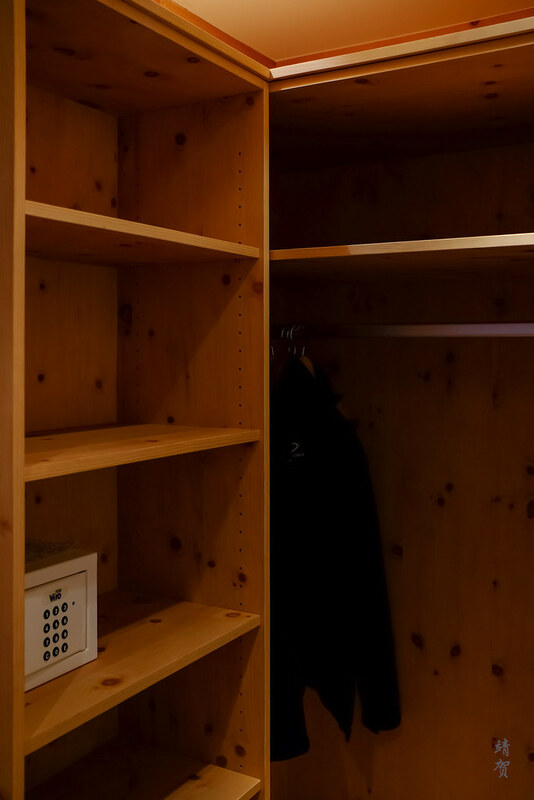 On the left is a relatively large closet space with plenty of cabinet space for your ski helmet, goggles and hanging your mid-layers. In one of the cabinets, guests can find a hotel safe to store one’s valuables. After the small foyer, the bathroom is found next. For a standard room, the bathroom size is decently spacious. 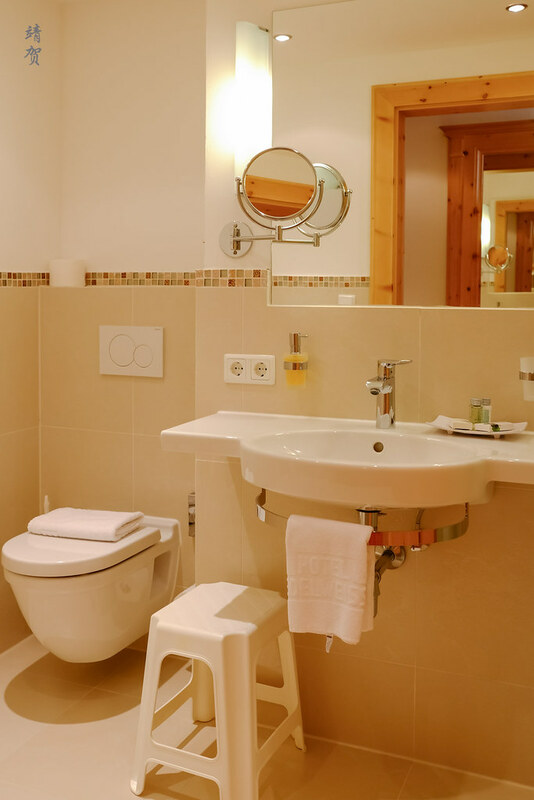 Personally I prefer brightly lit bathrooms and this one was furnished simply with a hanging countertop, meaning there is not much space on top for your toothbrushes, toiletries and shaving kits. Underneath, there was a stool provided which is relatively handy to place your towels and used clothes when using the shower. 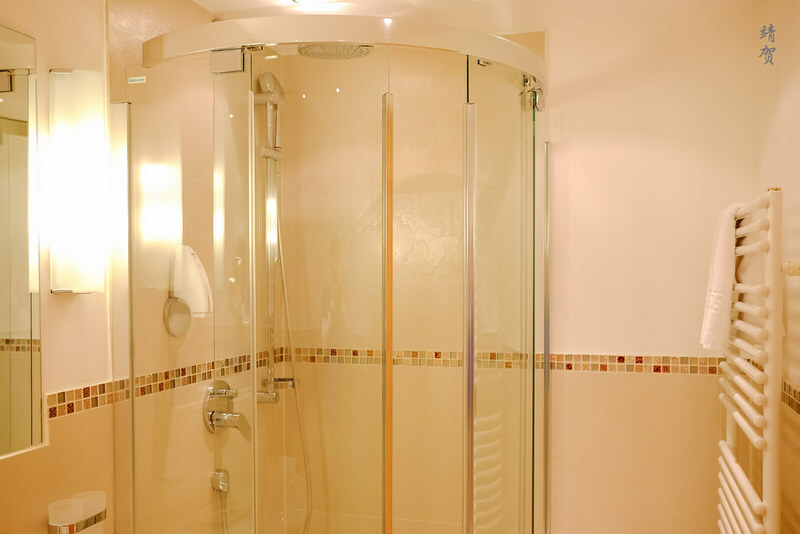 The bathroom is equipped with a walk-in shower enclosure that can be closed with a glass door. Inside there is both a hand-held shower head and a rain shower fixture on the ceiling. With this setup, it was very nice to use as it ensures the rest of the bathroom remains dry even after a shower. Across from the shower enclosure, there is a heated towel rack which is the norm to have in cold weather locations. 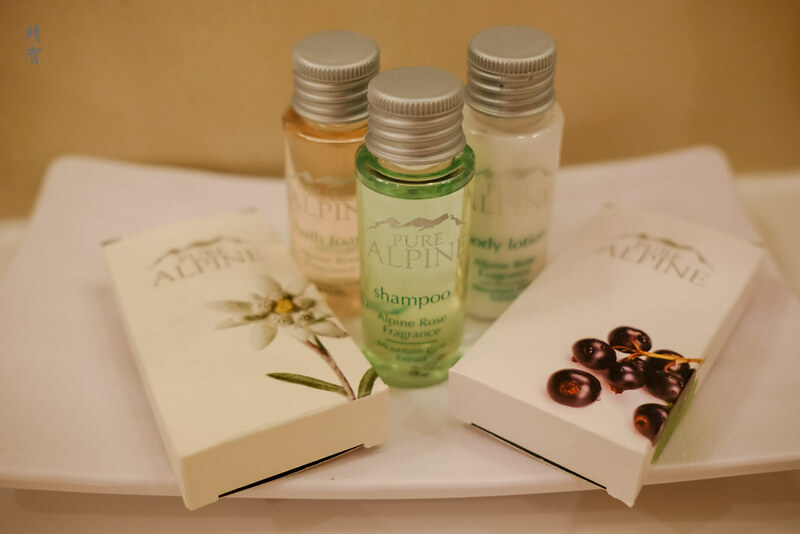 In addition to the wall-mounted body wash, there was small bottles of Pure Alpine amenities containing shampoo, bath foam and body lotion. In the other 2 boxes, there is a shower cap and some vanity items like cotton buds and pads. I should note that the amenities are not replenished daily but once in 3 days as it was only replenished once during my 5-day stay. The bedroom proper is located further inside the room. While there was 2 single beds adjoined to for a double bed, one side of the bed has a blanket cover. Since the room costs more for double occupancy, it was a way to ensure the number of guests are accurate, though this was the first time I have seen such a setup to dissuade guests from stating a lower guest number. On the side of the bed to be occupied, there was a pair of pillows, one blanket, one bathrobe and a pair of slippers. As expected this was a room meant for one person only even when there is enough space for 2. Generally speaking, I prefer to pay for the room and it should not be the hotel’s business to say whether the room is for one or 2 person. After all I am still occupying the same square feet of space. Furthermore as my stays are generally at the larger American-based hotel chains, they usually have no issue with me booking the room for 1 person and having 2 person turn up for the stay. In fact none of the SPG hotels I have stayed in have even mentioned anything when the number of guests do not match the reservations since they allow the 2nd guest to stay free. Next to the bed was a couple of armchairs with a desk located across. On the wall across the bed was a small wall mounted flatscreen TV which I did not really use during my stay since majority of the channels are in German. 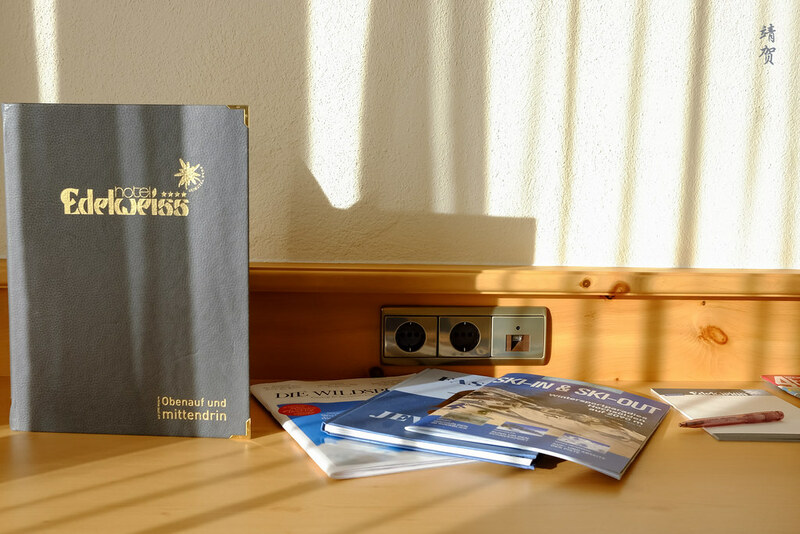 There was the hotel and area information booklet on the desk along with a visitor magazine but the desk was lacking in a chair for those who might want to use it for gaming on the laptop or to work. 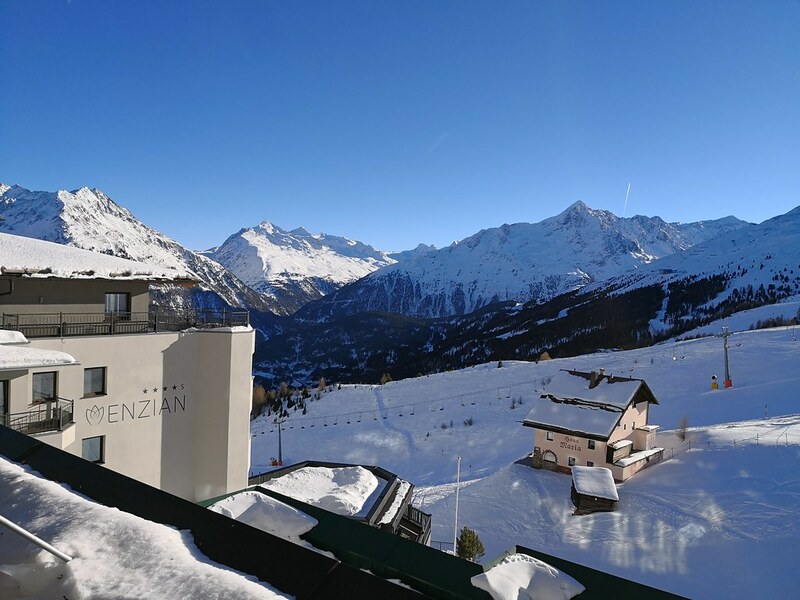 Beside the desk, guests can go through the door into a balcony with a fantastic view of the piste and the Ötztal valley. 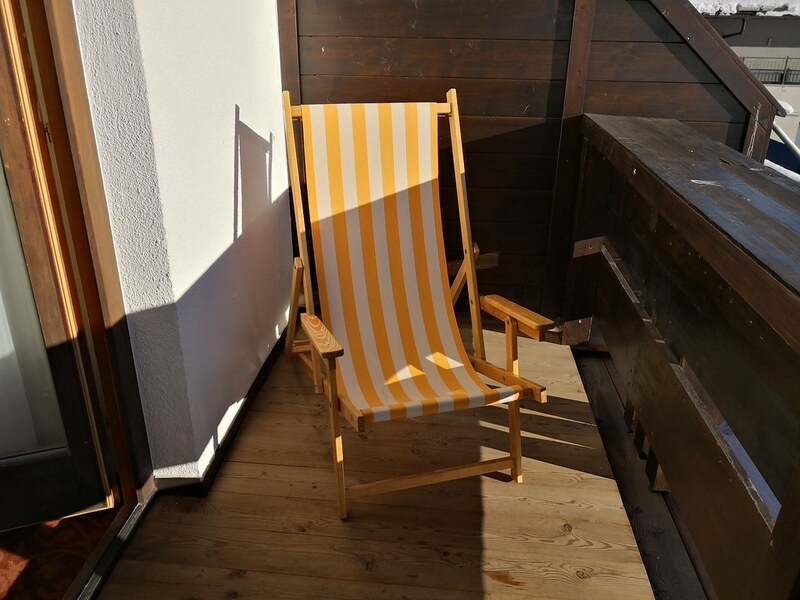 On the balcony, there are actually 2 foldable deck chairs to lounge when the sun is out. Since there was no fridge in the room, I made use of the balcony to store my drinks that I want to keep cold. Back in the room, there was a piece of chocolate beside the bathrobe. I had mistaken it for a turndown amenity, but it seems to be more like a welcome snack. There was no turndown service here as the only housekeeping service is in the morning. However there should be no issue in getting replacement towels if guests need them in the evening. 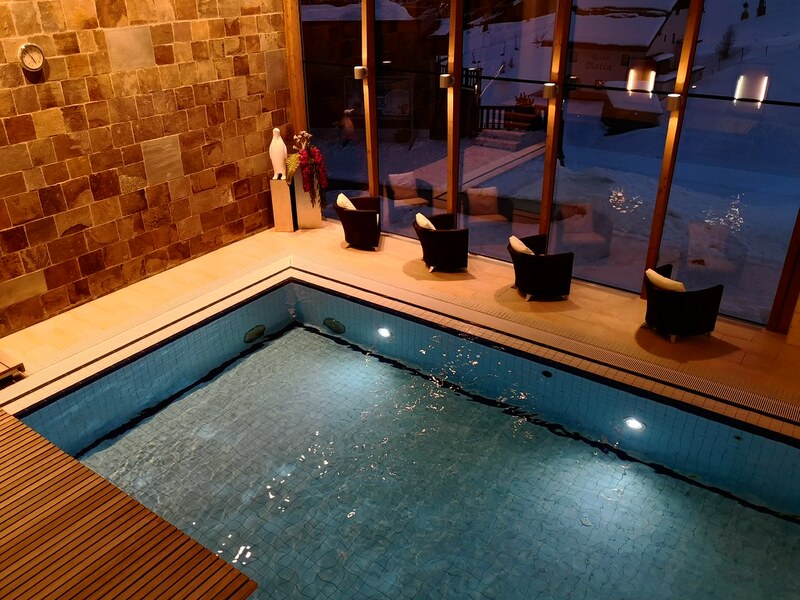 As a skihotel, one of the more important facility to have is the spa. This property did not disappoint as there was a nice indoor pool located one floor below the ski storage room, or 2 floors below the lobby and reception. The indoor pool has large windows that opens out to the mountain side and this made for a very nice setting. Located alongside the pool was a deck with several chairs to laze by the poolside or just to admire the view of the setting sun on the slopes. 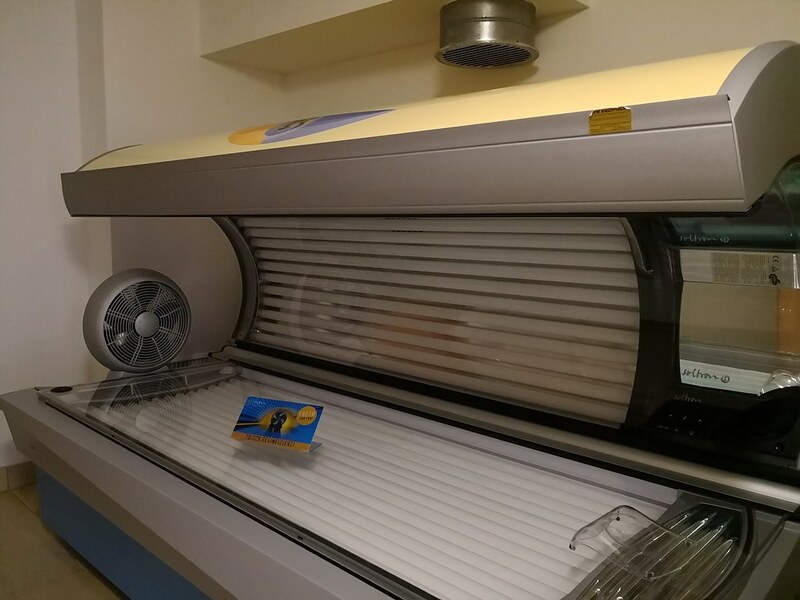 Guests can also find a tanning machine that did not seem to see much use inside a private room within the pool area. 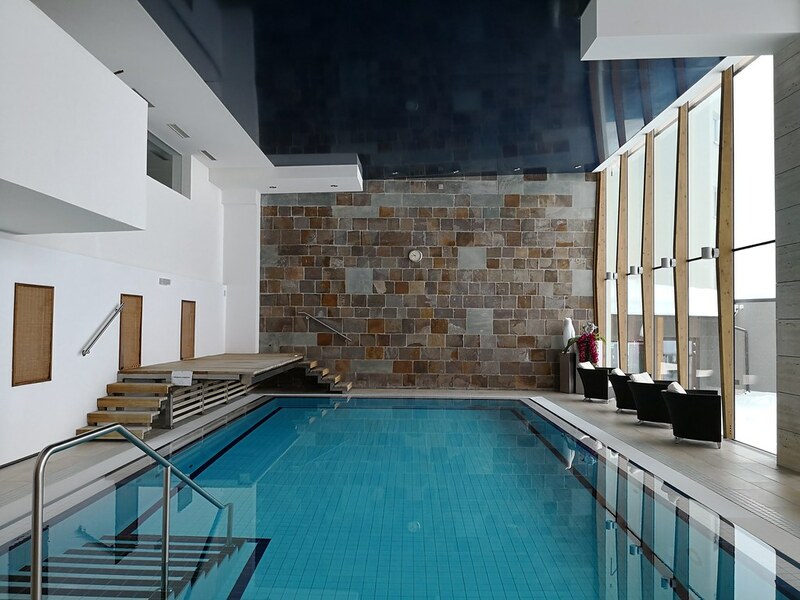 The mezzanine floor above the pool is where the access to the spa is found. Entry into the spa is permitted only for adults in the evening though families with children are allowed sometime before 4pm. 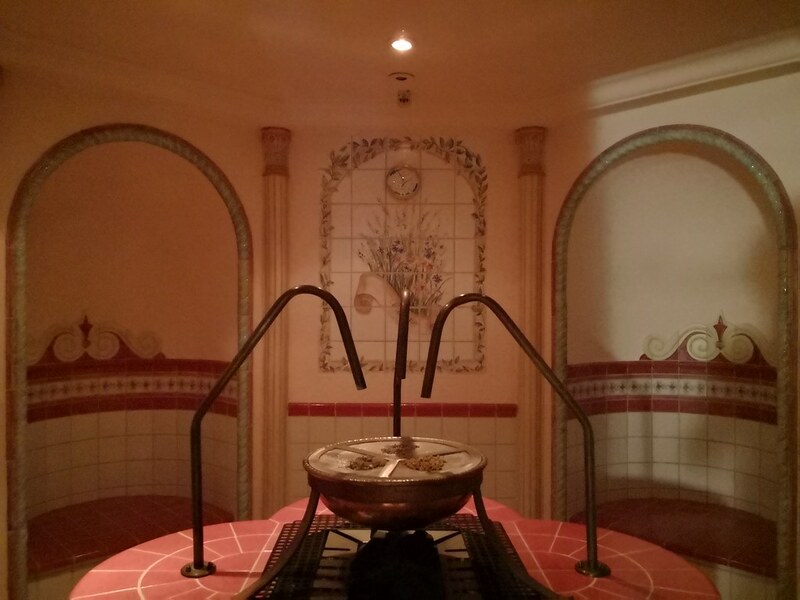 Inside the spa, there are four enclosed sauna rooms that can fit about 4-6 people. Amongst them are a Finnish wood sauna, a thermal steam bath, a salt brine steam bath and an herbal steam bath. 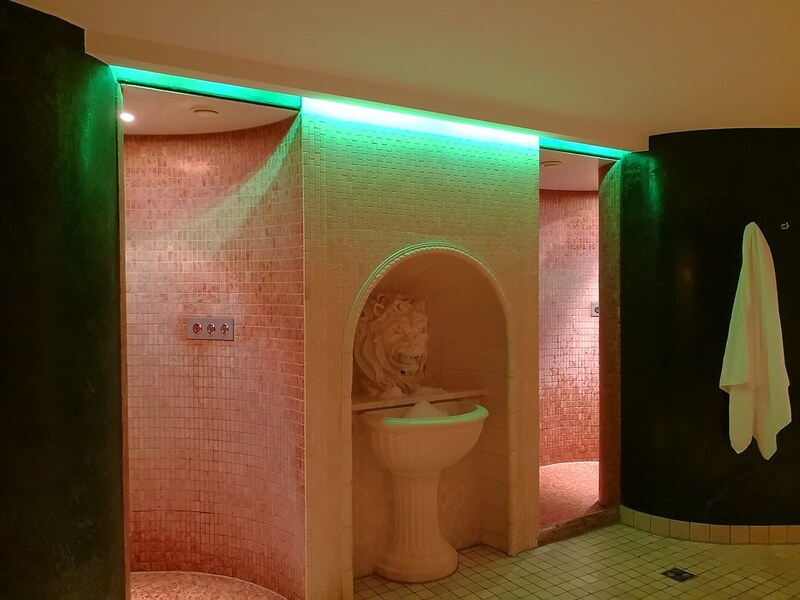 There are 3 open shower areas with an ice cold water fountain to refresh oneself in between using the various steam baths. While the sauna did not have a whirlpool, the steam baths were fantastic to use after skiing in the winter time. 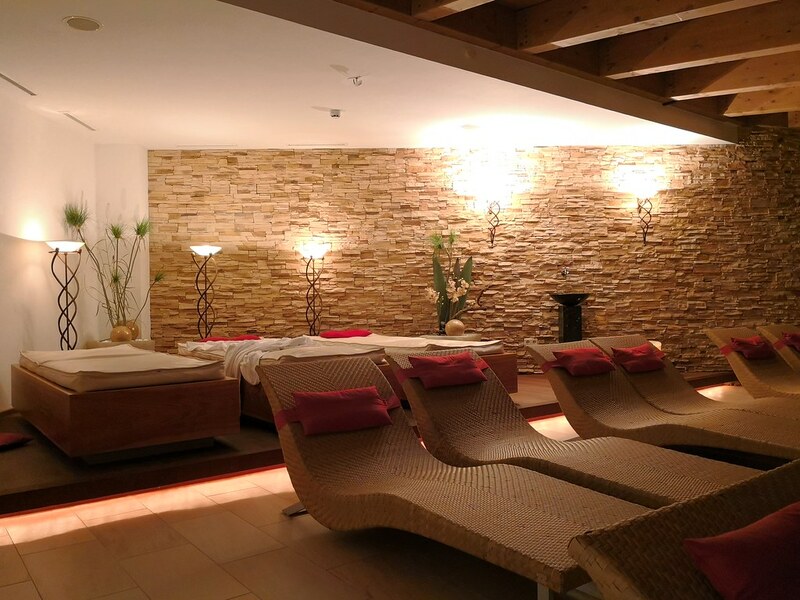 And finally when you are sufficiently warmed up, head upstairs from within the spa to reach a relaxation lounge. This spa lounge has several deck chairs along with 3 water beds. 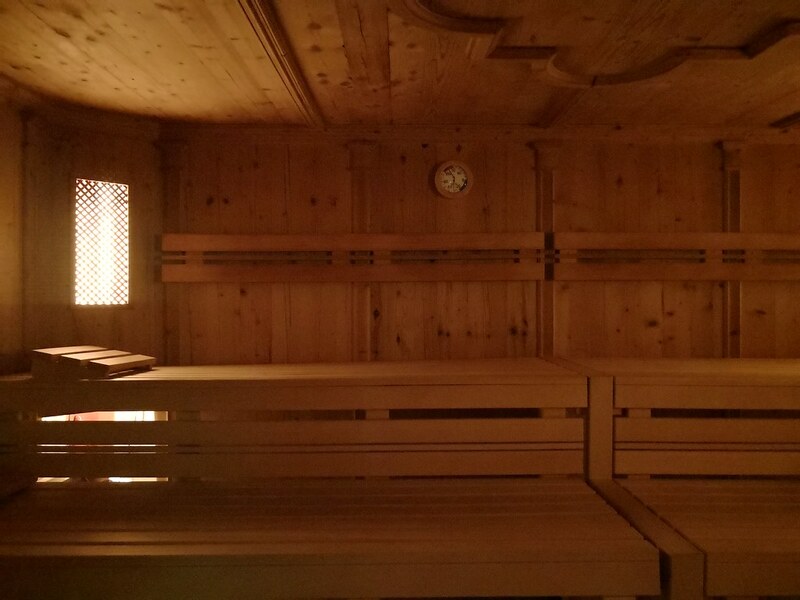 Taking a short nap after the steam bath on the water beds really soothes away the sore muscles from skiing. That is why I do enjoy the relaxing facilities of a ski hotel! Across from the spa entrance on the mezzanine floor above the pool was a small room containing a fitness centre. 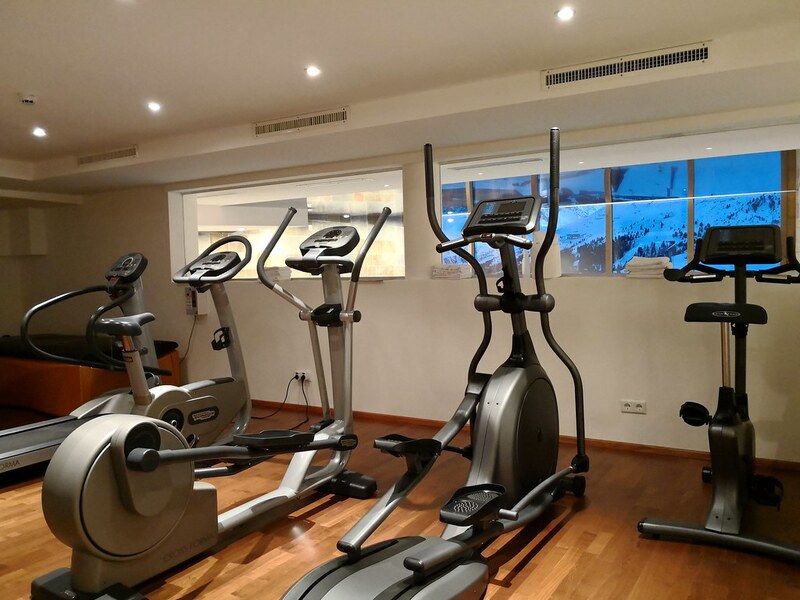 While small and consisting of a few machines and some yoga mats, they were more than adequate since most guests come here to ski and not work out on the treadmills. The last noteworthy facility inside the hotel was a library and cigar bar a short walk from the restaurant on the lobby level. 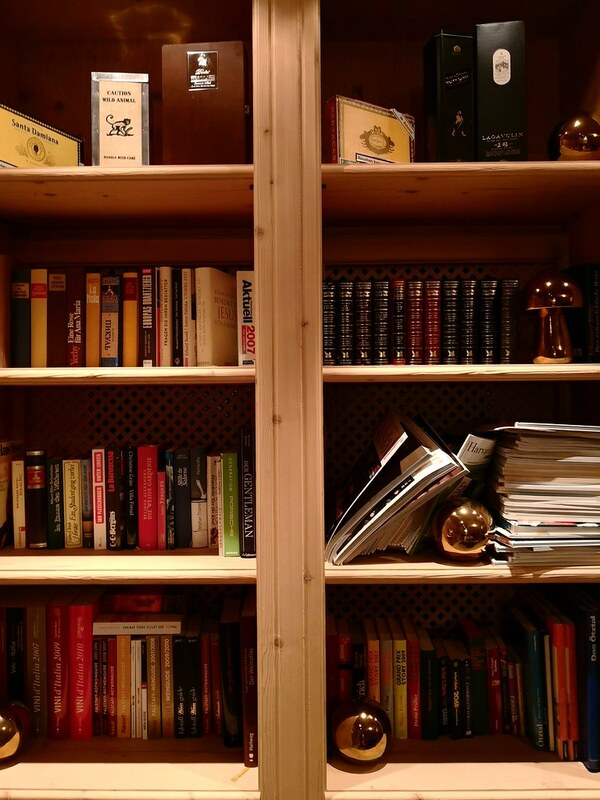 This enclosed room has shelves full of books and magazines though most of them are in the German language. 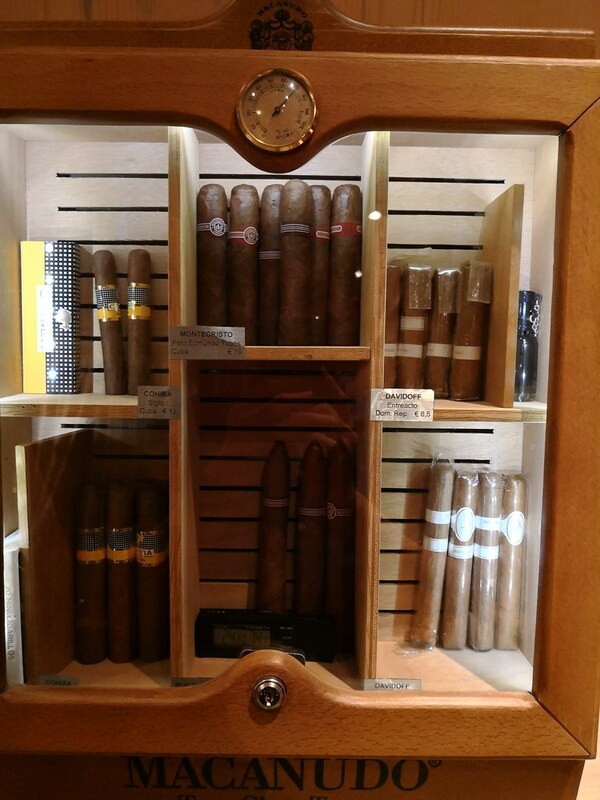 In addition to functioning as a library, there are several chairs set around a table with a small cigar humidor where cigars are stored for sale. 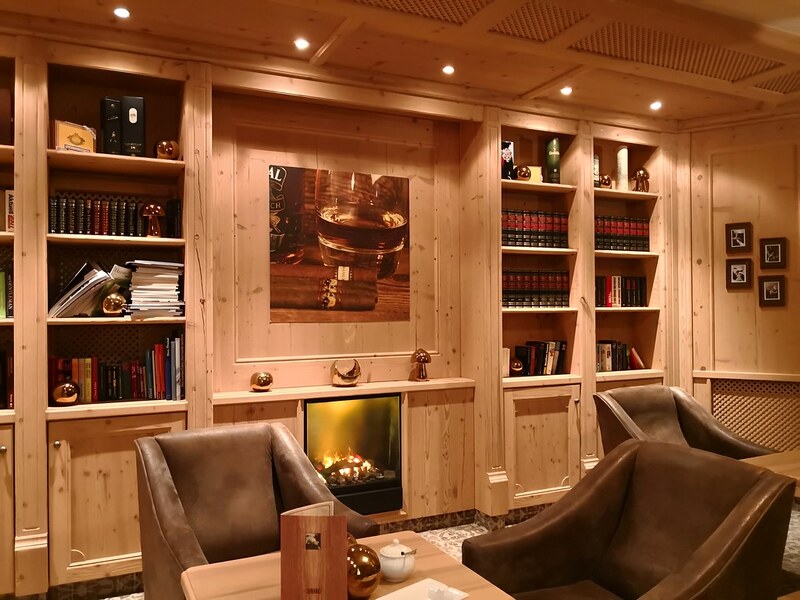 This venue can be popular with guests after dinner time for smoking so guests planning to get some reading could bring the books out to the lounge if they do not plan to smoke. During my stay here for the 5 days between Christmas day and leaving just before New Year’s Eve, the hotel was crowded but not full as I expected. However the service was very cordial and the staff were helpful in providing bandages for me when I hurt my finger 2 days prior to checking out. 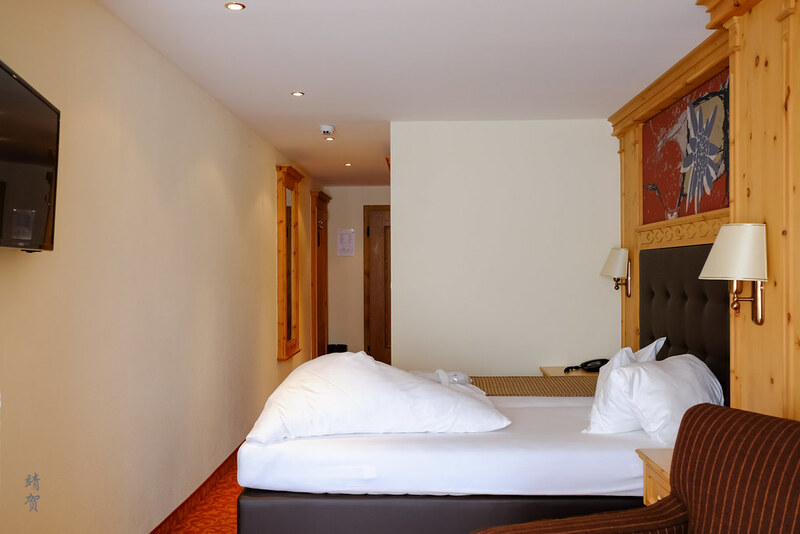 While the hotel might be old, the rooms and facilities do receive refurbishing and there was adequate facilities to satisfy skiers on a vacation. However there was a minor problem I encountered during my stay and that was the slow and unstable wifi in the room. It is difficult to use the in-room wifi to stream videos online though it is acceptable when using it from the lounge. On top of the comfortable rooms and well maintained facilities, the friendly service where the staff seems to know all their guests does make for a memorable stay. 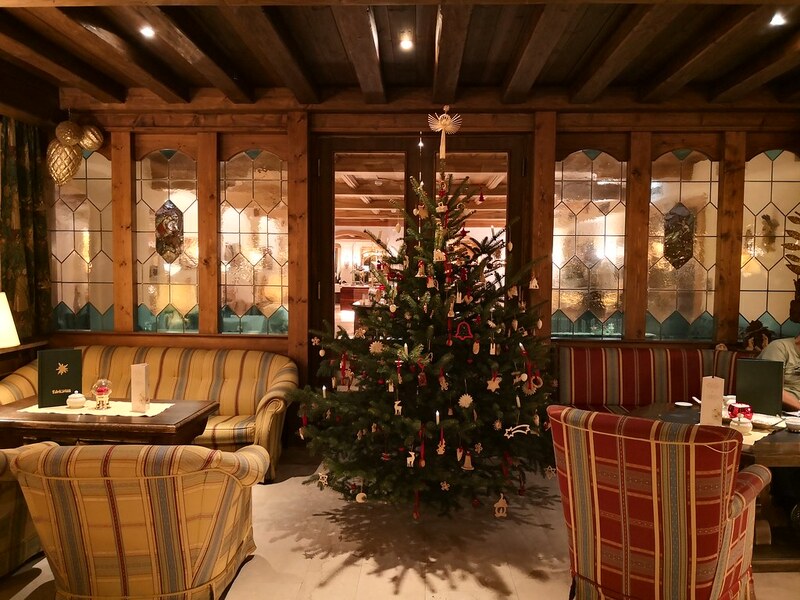 Though there are some aspects of the stay that was lacking like in-room wifi and the lack of dedicated ski and boot storage. 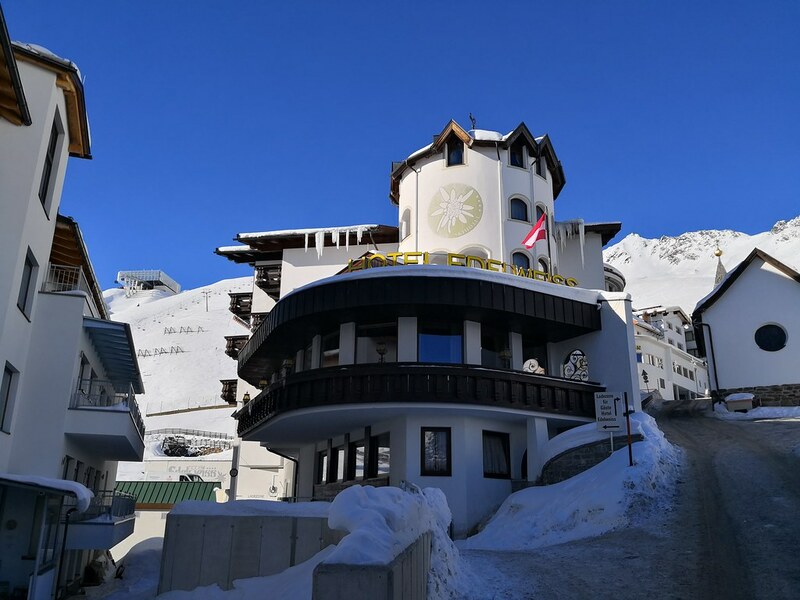 As for the value and whether I would recommend this hotel for a ski holiday in Sölden, look for the review of the food and beverage in the next installment.